Thought I would share a photo of the ring I made my husband as a gift for our anniversary this year. I made him this new ring; this is an actual bullet casing from his 357 gun. I guess you could say "I made his day". 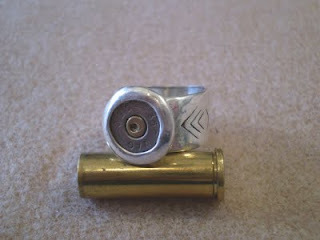 If you would like to see what the woman's style bullet ring looks like; go check it out on my classes blog. You should email this to clint eastwood..it would make him proud! Yeah what a great hubby gift!